Got some time? Go play some games. Mae Govannen to the Isle of Estë, a quiet sanctuary amidst Lake Lorellin, home of the dream master Lórien’s wife, Estë the gentle one. Healing rest is her gift, and her gardens on the isle of mists and tall trees offer refuge and rehabilitation for weary souls and broken hearts. You are most welcome to linger awhile here and explore the grounds. Whether you have stumbled upon this place by chance, or have been here before and you’ve returned seeking a peaceful respite from a busy or trying day, or are looking for ideas for your own healing garden, may your visit here be an enjoyable and informative experience. Come as you are … many botanical delights await to lift your spirits and perhaps help to ease any minor physical suffering. Information in this article is provided for informational purposes and is not meant to substitute for the advice provided by your own physician, alternative health therapist, or other medical professional. You should always check first with your health care provider before using any of the herbs listed in this article. If you undertake any treatment methods mentioned in this article without such supervision, you are solely and entirely responsible for its outcome. CoE, the contributors to this article, nor anyone else connected with this site cannot held be responsible for your actions nor any conditions resulting thereof. The opium latex extracted from the seed pods of these flowers served as a highly effective pain reliever, a defense against poison and venomous bites, and helped to alleviate emotional maladies such as melancholy and nervous tension. However, due to the addictive properties of this plant, it is assumed that Estë prescribed this medicine sparingly, with much discretion and care. Also, because of the controversial nature and confusing legalities of this particular poppy flower (the seeds are legal in most countries, though it may not be legal to actually plant the seeds in your area), the following Red Poppy is a beautiful legal substitute for your garden. Averages 2 – 2 1/2 feet in height. Red poppy has an erect, hairy stem that bears bristly, pinnately divided leaves. Scarlet flowers of red poppy (late May-October), 2 inches across, have blue-black stamens and four large petals, each with a purplish-black dot at the base. The fruit of the red poppy is a capsule containing many black seeds. Native plant of Europe, naturalized in North America. This flourished in the fields surrounding the cemeteries of the Flanders region of France and Belgium, where thousands of Allied casualties of World War I are buried. Sedative and analgesic. Contains alkaloids (including papaverine, rhoeadine, isorhoeadine, and many others), meconic acid, mekocyanin, mucilage, and tannin. The alkaloids are similar to those in the opium poppy, but are much milder. Red poppy flowers are mildly analgesic and sedative, and have long been used in European herbal medicine, particularly for ailments in children and the elderly. Used chiefly as a mild pain reliever and as a treatment for coughs, red poppy may also be used for insomnia, irritability, coughs – especially paroxysmal coughs – and asthma, and is usually given as a syrup. The flowers are also used to color teas, wine, ink, and medicines. The seeds are popular for baking. Infusion – Pour a cup of boiling water onto 1- 2 teaspoonfuls of the dried petals and leave to infuse for 10-15 minutes. Drink three times a day. Tincture – Take 2-4 ml of the tincture three times a day. In northern regions, sow in the early spring (surface sow, then in the spring, lightly rake where you sowed to trigger germination); in southern regions, sow in the fall. Sow on the surface of moist soil (do not cover). Keep moist but not soggy and at around 60 F, and seeds will germinate in 2-4 weeks. This plant grows to 18-24″ tall. It prefers full sun but will tolerate partial shade. The soil should be loose and well-drained. Prefers neutral to alkaline ph, but is adaptable. Does not transplant well. 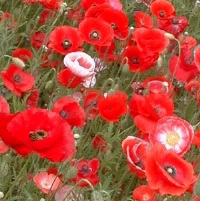 The petals of red poppy should be collected on a dry morning after the dew has dried in the months of July and August. Dry carefully. Here is an Athelas type plant of Modern Earth! Kings Cureall (similar to Kingsfoil!) Common Evening Primrose, Fever Plant, Great Evening Primrose, Nightwillow Herb, Scabbish, Scurvish, Tree Primrose, and Wild Beet. Averages 3 – 4 feet in height. Each flower of the evening primrose can vary in size from one to two inches in diameter, with four reflexed sepals, four broad petals, eight stamens, and one pistil with a cross shaped stigma. The leaves are lanceolate with wavy-toothed edges, growing alternately along the stems. The flowers open at night and are fragrant. The Evening or Tree Primrose, though originally a native of North America, was imported first into Italy and has been carried all over Europe, being often naturalized on river-banks and other sandy places in Western Europe. It is often cultivated in English gardens, and is apparently fully naturalized in Lancashire and some other counties of England, having been first a garden escape. The entire plant is edible. It is an astringent and a sedative. Contains gamma linolenic acid (GLA, an essential fatty acid), tocopherol (Vitamin E), tryptophan (an amino acid), sitosterol, and Vitamin B. There are many. The oil is the most sought after part and is sold in health food stores. Researchers are looking into a wide variety of possible applications for this plant. The oil is said to have pain relieving and anti-inflammatory properties, and is an excellent remedy for PMS and associated breast tenderness. It also appears that the oil is also useful to counteract alcohol poisoning, and highly effective in preventing hangovers. A study in Inverness, Scotland, demonstrated that the oil will encourage a liver damaged by alcohol to regenerate. Other work indicates that the oil can help withdrawal from alcohol and ease post-drinking depression. Historically, Evening Primrose has been used to make a tea for the treatment of respiratory related problems such as coughs. One teaspoon finely chopped plant to a cup of boiling water and then taken cold, according to one source. Also, an ointment made from the plant is supposed to be good for skin irritations. Infusion – Pour 1 cup of hot water on 1 teaspoon of the herb, and leave to infuse for 10-15 minutes, then allow liquid to cool. Take 1 cup a day, a mouthful at a time. Tincture – Take 5 to 40 drops, as needed. The plant requires well drained soil and full sun. Seeds can be started in April in the shade or indoors and transplanted when seedlings are an inch high. The plant blooms from June to September or October with flowers appearing the second year. The leaves are narrow and can be anywhere from 1 to 5 inches in length. The plant can reach 3 to 4 feet in height. It is a biennial and will re-seed on its own. 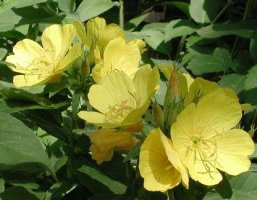 Evening Primrose, like Athelas, has long leaves, ‘great virtues,’ and is a healing plant. Athelas has the power to calm and clear the mind as well as lessen the pain of a wound. Evening Primrose is said to be a sedative and to have anti-inflammatory qualities. There is also the similarity of their common names King’s Cureall and Kingsfoil. The flowers of Evening Primrose are fragrant, however it is the leaves of Athelas that are described as having such wonderful scent. Side effects of headaches, skin rashes, and nausea have been reported. Use for epileptics is not recommended. Averages 1 – 3 feet in height. Square erect stems tinged with a reddish-purple color, with opposite, dark green, ovate to lanceolate, serrate leaves. Tiny purple flowers in whorls and terminal spikes bloom from July through August. Entire plant has characteristic menthol scent. Peppermint is native to Europe and Asia, and some varieties are indigenous to South Africa, South America. Naturalized in North America and cultivated in Oregon, Washington, and Wisconsin. Carminative, anti-inflammatory, anti-spasmodic, aromatic, diaphoretic, anti-emetic, nervine, anti-microbial, analgesic. Contains Menthol, menthone, fasmone, methyl acetate, volatile oils, tannic acid, terpenes, and vitamin C.
Peppermint is a widely used herbal remedy. A tea made from the leaves is highly effective in the treatment of fevers, headaches, digestive disorders (especially flatulence) and various minor ailments. An infusion is used in the treatment of irritable bowel syndrome and digestive problems. Externally, peppermint oil or menthol is used in pain relieving balms, massage oils, and linaments. Menthol is cooling and anesthetic when applied to the skin, increasing blood flow to area to which it is applied. 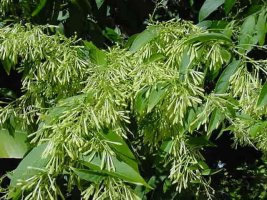 The oil is also is antiseptic and strongly antibacterial, with anti-inflammatory and ulcer-healing effect, though it is toxic in large doses. Inhalation of the herb or oil is effective against excessive respiratory mucus, as well as a useful remedy to increase concentration. Infusion – Pour a cup of boiling water onto 4 – 6 teaspoonfuls of fresh herb and leave to infuse for 10-15 minutes. Drink three times daily, or as needed. Sow on soil surface and keep moist to germinate in 15 days at 70F. Transplant to moist, rich soil in partial shade, especially where it’s hot or the sun is intense. Can be propagated by root divisions and by cuttings once established. 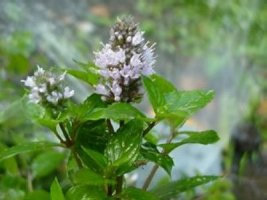 Mint can be invasive, so keep an eye on it or grow it where it has plenty of room. This perennial plant also repels insects, rats, and mice. Harvest when flowers begin to develop and set out to dry. The dried herb remains strong for a long time. Avoid prolonged use of inhalants of the oil, which must never be used for babies. The stems, growing 1 or 2 feet high, are gray-green and angular, with flaking bark. The gray-green leaves are opposite, sessile, downy, and lanceolate to oblong-linear. The lilac-colored, tubular flowers are arranged in successive whorls up the stem. Each false whorl consists of 6 to 10 flowers. Flowering time is July to September. Lavender is a Mediterranean shrub which is cultivated for its aromatic flowers in the United States and Europe. Antispasmodic, aromatic, carminative, cholagogue, diuretic, sedative, stimulant, stomachic, tonic, relaxant, antibacterial, antiseptic. Contains linalol, linalyl acetate, lavandulol, lavandulyl acetate, limonene, terpineol and caryophyllene. Used as a nerve tonic, cough cure and anti-paralytic, gargle, mouth-wash for halitosis and improve the gums. An essential oil of lavender, for external application, (no essential oil should ever be taken internally), soothes headaches, migraines, cold sores, dizziness, reduces inflammation, fever, and calms angry joints and muscles. Used in moderation, lavender may be taken as a mild sedative and to relieve fainting spells. Tea steeped from the flowers is a tonic. Prevents fainting and stops nausea. A decoction of the leaves is a useful remedy for stomach problems, nausea and vomiting. Once treated dropsy, epilepsy, cramps, convulsions, palsy, toothache. In aromatherapy, lavender oil is used to promote relaxation, relieve anxiety, and treat headaches. A traditional remedy for gassy stomach. sachet, making perfumes, and delicate flavoring for beverages, cakes, muffins, and fruit soups. 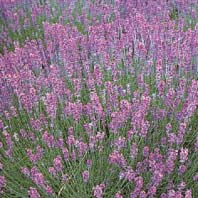 Lavender flowers were once used for centuries to preserve linens from insects and leave them with a fresh, clean scent. A fine nerve tonic may be made by preparing a tincture (Lavandulae composita) of lavender, rosemary, crushed cinnamon, and nutmeg. Dabbed on the forehead, this eases nervous headaches and quickly calms a fever. Infusion – Steep 1 tsp. leaves in 1/2 cup water. Take 1/2 to 1 cup per day. Oil – Take 5 drops on a sugar cube or mixed with 1/2 to 1 tsp. honey, 2 times per day. Bath – Mix 5 drops of essential oil in warm water; a soothing bath. One of the most popular medicinal herbs since ancient times; in Arab medicine, it is used as an expectorant and an antispasmodic. In European folk tradition it is used as a wound herb and a worm medicine for children. Hardy perennial prefers full sun in well-drained loam or sandy soil. Can be sown early in spring. Plant seeds 1/8 inch deep and cover with fine soil, well pressed-down, 1 inch apart. Germinates in 10 – 20 days. When plants are 2 inches high, thin to 10 – 12 inches apart. Do not over-water. Cut the stems before the buds open. Remove the leaves then tie the stems in small bundles. Hang them upside-down to dry. Avoid high doses during pregnancy because it is a uterine stimulant. English Chamomile, Roman Chamomile, True Chamomile, Ground Apple. Please note that there is much contradictory information with regards to both Roman Chamomile and German Chamomile (which has also been stated as being the “True Chamomile” in some sources.) It is generally found that both types are useful for same medical applications. Perennial plant grows close to the ground and averages 3 – 12 inches. Fine feathery gray-green leaves grow from the stems, and are thicker than that of German chamomile (which is an annual plant). Flowers resemble miniature daisies with yellow centers surrounded by white petals, with an apple-like fragrance. Anti-inflammatory, spasmolytic, vulnerary, antimicrobial, mild sedative, carminative, antiseptic, anticatarrhal. The active principles are a volatile oil, of a pale blue color (becoming yellow by keeping), a little Anthemic acid (the bitter principle), tannic acid and a glucoside. A cup of hot chamomile tea may help soothe an upset stomach, and help those who suffer from insomnia. Relieves cramps associated with PMS, muscle cramps, swelling of gums in the case of gingivitis, bladder, colds, headaches, and hemorrhoids. Bath – Add two teabags or a few drops of essential oil to a full tub of bathwater to soothe hemorrhoids or skin problems. Start seed indoors from late winter through early summer. Sow seed on the surface of pre-moistened potting soil and mist to ensure good seed and soil contact. Loosely cover container with a sheet of plastic wrap to retain moisture. Germination in 14 – 28 days at 60 – 70F. Seeds can also be directly sown outdoors in early spring after danger of frost has passed. If sown in container, transplant to individual pots when large enough to handle. Gradually introduce to outdoor conditions. Spacing is best at 12 inches apart. 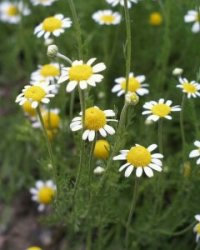 Do not use if allergic to ragweed or daisies, as Chamomile is a member of the same daisy family. Do not use for long periods of time. Do not use the essential oil during pregnancy as it is a uterine stimulant. Many beautiful fragrant flowers can be found in Estë’s garden, especially those that come to life in the evening. Here are a few examples of wonderfully scented plants you can grow in your own nighttime garden sanctuary. Averages 8 – 10 feet. Perennial shrub with glossy, smooth, simple leaves 4 – 8 inches long. Greenish-creamy white tubular flowers rise from above leaves along the stem, followed by shiny white, fleshy berries. Flowers bloom in cycles at night during warm weather, with a very sweet scent. Plant seeds in full sun or partial shade during warm weather. Prefers sandy soil and grows best at 75-85 F. Germination takes about 2 – 6 weeks. 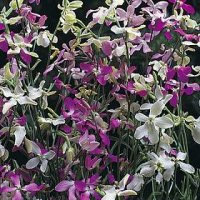 It is hardy only to 25 F, so in the northern regions, grow it in a container which can easily be set outside in summer, and bring inside during winter, placing it in a sunny window. It will grow 2-3 feet in a container and never need a pot larger than 5 gallons. If growing inside, it likes full sun or light shade and needs a very sunny window. Plant tends to get leggy and floppy, so it serves best as a hanging plant indoors, or propped up against a fence or trellis if grown outdoors. Attracts butterflies and hummingbirds! Averages 6 feet and more in height. Can grow as much as 12 – 18 feet in one year. Perennial vining plant in native tropical regions, annual in northern regions. 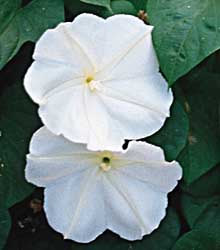 Large attractive heart-shaped leaves are 3 – 8 inches long, with 6 inch white fragrant flowers which open at dusk and close by morning, though sometimes may remain open on overcast days. Soak seeds overnight before planting. Sow seeds directly into your flower garden, early in spring after danger of frost has passed. Plant them where they can climb quickly towards the moon. Cover seeds with ¼ inch of soil. Seeds can also be started indoors 3-4 weeks before the last frost to get a head start on the season. Water thoroughly once. They germinate easily and will grow quickly. Thin or space your plants to at least 6″ apart. Prefers full to partial sun during the daylight hours. Moonflower thrives in poor, dry soils, and they are easy to grow with little care or attention, though susceptible to frost. As the plant is a climbing vine, they are best grown alongside a fence or trellis. They will re-seed on their own. Seedlings do not transplant well. Averages 18 inches in height. Hardy annual with small grey-green leaves, and four petaled lavender, mauve, and white blossoms which open in the early evening and emits a delicious fragrance. Originated in Europe. Cultivated on other continents. Relatively rare in a wild habitat. Sow seeds directly into your flower garden in early spring to early summer, after danger of frost has passed. Cover seeds with ¼ inch of soil. When large enough to handle, thin to 3 inches apart. Prefers full sun, and moderately fertile, moist but well-drained, neutral to slightly alkaline soil. Can also be planted in a container such as a window box or hanging basket.